Fans of Serena were apoplectic over the blatant misogyny exhibited against her. (To compare and contrast, the same chair umpire was in charge of the men's singles final, when eventual champion Novak Djokovic exhibited the same behaviors which resulted in penalties for Serena, with no penalties for him.) Those who don't like Serena fell back on the tropes that she's a princess and a bully. He is, apparently, a cartoonist for a Murdoch newspaper in Australia. 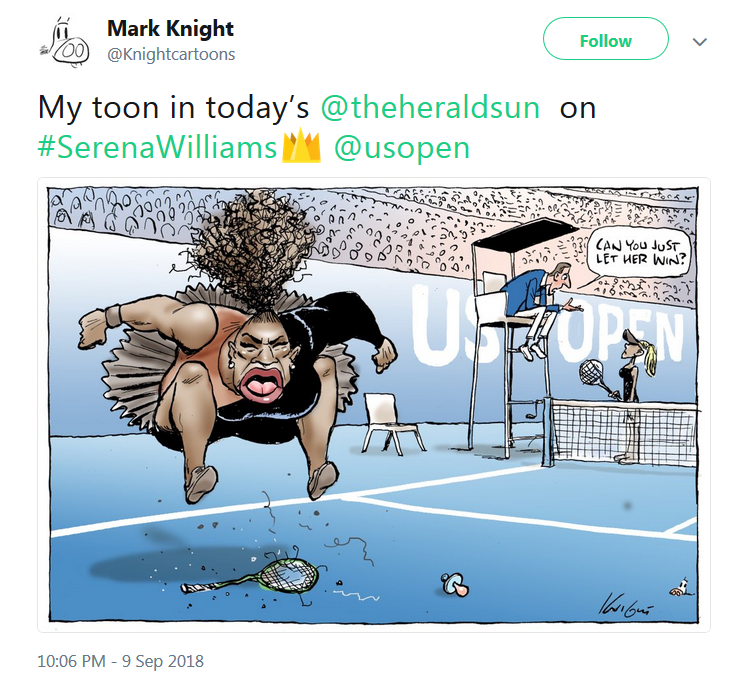 I won't even bother to explain how this is a racist depiction of Serena. I will say that it's not just misogyny she faces, but outright racism. She will break Margaret Court's record, and a black woman from Compton will seal her status as the greatest female tennis player of all time. And in a sport which has been dominated by white players for its entire history, this fact raises existential fears. In sporting terms, it's on a par with the fear white Trump voters have that they are about to be pushed aside by a browning population. Serena has faced this misogyny and racism her entire career. (Google "Serena and Indian Wells" for some data.) And she's done turning the other cheek. She shouldn't have to. Tennis needs her more than she needs tennis. And if she's going to start to speak out and defend her honor, then that's all to the good. The opprobrium some heaped on Serena this weekend wasn't because she was "acting like a spoiled brat." It was a racism she has dealt with her entire career. And she's not taking it anymore. The blatant misogyny. The racism that has been dealt to her all her life. The toon? Typical of the lilly white, racist Murdoch paper and their readers. Because you know expecting a WOMAN and/or a BLACK PERSON to act civilly, with good sportsmanship is SEXIST and RACIST. To Democrats/liberals when one of theirs loses or is criticized it is ALWAYS racism or sexism. Liberal women and blacks are simply too stupid, dumb and ignorant to be expected to act in a responsible manner. Can't believe what the artist was thinking when s/he created this toon. Pathetic. 3. At a Murdoch newspaper, being a racist and a misogynist is considered a plus. Notice the exaggerated lips, the hair...….. Right, because cartoonists ALWAYS exaggerate body features....but I guess it's only OK if you're white. certainly does not show what really took place. Serena Williams is the greatest woman tennis player of all time and people are trying to define her over one incident. I'll admit I'm a big fan of hers but she did have a point in her argument. I do think racism and misogyny is playing a role in this and it is a sad day. Hmmmm. Serena's temper tantrum related to having her serve broken and the potential for losing to her opponent, yes that's what took place. As for the 'yellow hair', the ends of her opponents hair WAS YELLOW/Blond. It's just more race baiting and excusing INEXCUSABLE behavior because the person is a woman and black. No. It was Serena's behavior and the lefts excusing it as OK because ...... sexism and racism that was and is shockingly disgusting. Not long ago they were claiming that not allowing her to wear outlandish costumes rather than the usual while competing was "sexism". "Hey Naomi, I'm really happy for you and I'mma let you finish, but Serena is the best female tennis player of all time!" Patrick Mouratoglou admitted to coaching Serena Williams during the U.S. Open final, but believes she never received his message. The booing was ridiculous. Serena lost her cool and the crowd egged her on. Poor Naomi had to apologize for something she didn't do. If you are black DUer reading this thread, aren't you ashamed that Serena needed such coddling from the black female official, who greeted Naomi Osaka with "Welcome to the big stage," and then proceeded to insinuate that the match ended wrong? Why did this black female official ruin the Japanese champion's moment? Because a black sister needed to be bottle-fed bromides like a baby? Because a black sister couldn't control her temper and continued to needle and demand an apology for a call that was based on her own coach making signals? Why do these black women not honor the rules of the sport and of good sportsmanship? The world saw Serena throwing a tantrum, a black official assuaging her--but a very gracious (though tearful) Osaka. Serena may have been a great player, but Osaka became the star with her grace and humility. If you look at the comments on the internet, THAT is what the rest of the world saw, too. Last edited by Elspeth; 09-11-2018 at 02:39 AM. It was a few games later when matters really escalated. Williams lost her serve at 3-1 up and demolished her racket — an automatic code violation that, because it came on top of an earlier warning, resulted in the automatic loss of one point. Ms. Williams opted to argue about this: She insisted that she didn’t cheat, she wasn’t coached, and therefore she shouldn’t have been docked. But it doesn’t matter whether she knew she was receiving coaching. She was being coached, as Mr. Mouratoglou admitted after the match, and whether she knew it or not is moot. So at this stage, she had been given a warning — one that couldn’t be dismissed retroactively — and had smashed her racket, an automatic violation. Mr. Ramos, effectively, had no choice but to dock her a point. That's an 18+ minute highlight video from 2009. At 4:50-4:55, Serena vs. tennis racket. At 13:55-17:00 Serena vs. FEMALE line judge, including preceding context. For the terminally curious, the "Grand Slam Rule Book" is linked at the bottom of this short article. The incident has caught headlines everywhere, with many voicing their displeasure online. Among those disappointed are male tennis pros James Blake and Andy Roddick, who confirmed the bias and backed Serena's stance. Both took to their Twitter accounts and admitted to saying worse on the court with no penalty. Serena not only received a penalty, but also got slapped with a $17,000 fine for three code violations. Tennis counterpart Victoria Azarenka also backed Williams as she live-tweeted the match and recognized the apparent inequality.